Rumeli Fortress in Istanbul is a stone and lime fortress built by Ottoman Sultan Mehmet II in 1452. The construction was strategically built across an Anatolian Fortress on the shore of Bosphorus in Istanbul. Both fortresses served as key points for blocking aid during Ottoman siege of Constantinople in 1453. The Fortress. Photo by Dennis Jarvis. Location: Yahyakemal Avenue No. 42, Sariyer, Istanbul. Take a passanger ferry to Yenikoy or Sariyer docks. Then take a bus 25E. Or from Besiktas catch a bus 43R (ride duration - over 1 hour). Or from Kabatas bus 25E, 40 or 22. Have cash ready to pay for public transport in Istanbul. Hours: 9:00 - 16:30 every day. Closed on Wednesdays. In 1452 exceptional Ottoman warrior Fatih Sultan Mehmet II developed a strategy for conquering Constantinople. He observed the failer of his predecessor in 1421 to take the city due to blockage of the Bosphorus by Byzantine fleet. The need to solely control transport going through the Bosphorus Strait was clear. The Anatolian side of the Bosphorus already had a fortress at the narrowest point of the waterway. The opposite side of the fortress had remains of a military construction. The site of the remains was a perfect spot for building a new fortress. Rumelihisari translated from Turkish as "Fortress of the Land of the Romans" was built there. The Sultan himself supervised strictly the construction and in only 4 months the giant walls and several supporting towers had been completed. 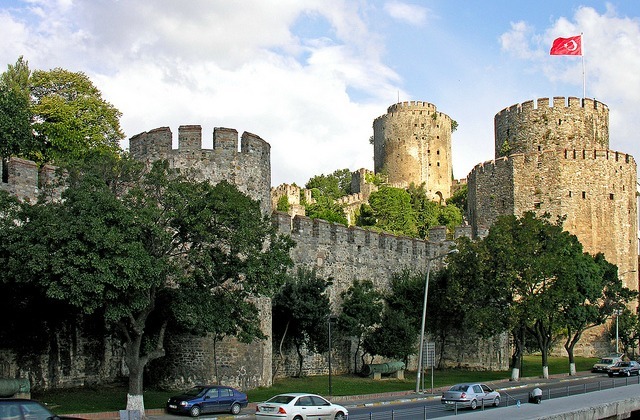 The Rumeli Fortress was designed to have three main towers and thirteen small watchtowers. The area of the construction takes 60,000 square meters (about 646,000 square feet). Largest tower is 9 stories high and goes up 28 meters (92 feet). The diameter of the tower is about 23 meters (76 feet). Thickness of walls - 7 meters (23 feet). The tower was first named after one of the Sultan's Ministers but then renamed to Fatih Tower after the Sultan Fatih Mehmet II who initiated the construction of the Fortress. The second main tower is located in the middle of the construction right at the waterfront. Large cannons were placed here to fire in case of need. The tower also has 9 stories like the Fatih Tower but is slightly lower (22 meters/72 feet). Diameter of the middle tower is also 23 meters (76 feet). Thickness - 6,50 meters (21.3 feet). The middle main Tower carries Halil Pasha name after Sultan's minister. The third main tower was put in the South of the Fortress. It is 8 stories high, 21 meters (69 feet) high, with a diameter about 27 meters (88 feet) and walls of 5.7 meters (18.7 feet) thick. This is Zaganos Pasha Tower. The Fortress had housing for soldiers, a mosque, three fountains mantled into the walls and several food cellars. At least 400 Ottoman soldiers were placed in the Fortress. After Constantinople was conquered and the Rumeli Fortress no longer was needed as a defense point it continued to serve as customs point. Later in the history (17the century) the construction was used as a prison. From 1989 till 2008 Concerts of Rumeli Hisari took place at the entrance of the Fortress. Enrique Iglesias, Ray Charles and Vanessa Mae performed here. Take a look at the Rumeli Fortress from a Bosphorus cruise or while on hop-on hop-off bus if you are short in time. Wear comfortable shoes. The area around the fortress is hilly. Be prepared to climb stairs once inside the fortress. The construction was built on a hill and has many steep stairs. Rumeli Fortress is also referred to as a Rumelian Castle, city walls or Rumeli Hisari in Turkish. "Throat Cutter" was the name of the construction when it was first built ("Bogazkesen" in Turkish).